A beautiful London rooftop and gin, what better combination could you ask for? Launching on July 16th 2014, Tanqueray No. TEN will be transforming the rooftop back bar at Vista (The Trafalgar) into an exquisite Citrus Garden, creating an oasis of tranquility among the chaos of the capital. The Vista bar and its iconic British skyline acts as the perfect setting for this exclusive Citrus Garden. On entering, a citrus archway adorns the secret entrance and through an assortment of botanical grapefruit, lemon and orange trees, the Tanqueray No. TEN garden awaits. The Pop Up is in celebration of the new bottle design and has taken inspiration from the whole handpicked citrus fruits and botanicals of Tanqueray No. TEN. Intimate cocktail masterclass sessions hosted by Tanqueray brand ambassador, Tim Homewood, will be held in the Citrus Garden every Wednesday evening inviting guests to delve into the rich history of gin, learn about the distinct flavours of Tanqueray No. TEN and the art to creating gin-infused cocktails. 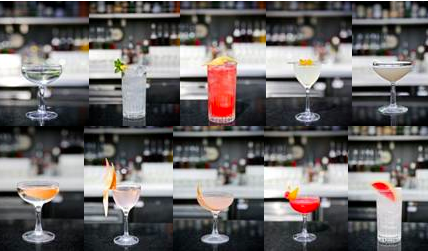 Guests will be greeted and welcomed with one of the ‘Perfect TEN’ cocktails whilst enjoying the Citrus Garden. The masterclass will begin with learning about the history of the British spirit alongside a gin tasting, allowing guests to explore the fascinating array of botanical notes iconic to Tanqueray No. TEN. After this, Tim will demonstrate how to create one of the ‘Perfect TEN’ serves before guiding the class to recreate and enjoy one of their very own TEN bespoke gin-infused cocktails. Guests will be invited to stay and relax on the boutique rooftop to experience the new ‘Perfect TEN’ menu. The bottle itself, is an elegant embodiment of Art Deco beauty meeting the fresh citrus squeeze, with the distinct lemon squeezer shape embedded into the bottom of the bottle. It’s tall and slender existence with sharp defined edges is a reflection of the sharp yet smooth flavours of the gin. The growing trend for at-home cocktails makes this luxury bottle an ideal centrepiece to every drinks cabinet. The new Tanqueray No. TEN bottle is available in the UK from May onwards. Available for purchase at Selfridges and Alexander & James for a recommended RRP £32.58 for a 70cl bottle.